Migrants in an irregular situation in the European Union (EU), namely those who do not fulfil conditions for entry, stay or residence, often suffer from specific health risks, such as those resulting from exploitative working conditions or precarious housing. As EU Member States, faced with an ageing population and the repercussions of a global economic crisis, struggle to contain public health expenditure, the right to health for all - regardless of legal status - must remain a key concern. 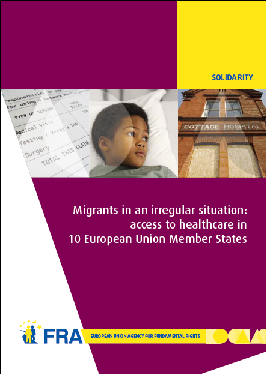 This report of the European Union Agency for Fundamental Rights (FRA) documents the legal, economic and practical obstacles that migrants in an irregular situation face in accessing healthcare in 10 EU Member States and proposes a number of ways to improve this access. The FRA found in particular that the risk of detection and deportation prevents migrants in an irregular situation from seeking healthcare, even in those countries where it is legally available, and suggests, among other improvements, disconnecting healthcare from immigration control policies.